The June, 2018, American Libraries magazine is one of the most thought-provoking issues ever. I believe the summary and links from Jim Neal’s Midwinter President’s Program on librarianship and neutrality should be required reading for every library science graduate student and used as a discussion starter in classrooms and libraries everywhere. From serving the literacy needs of patrons in prison and those of Women, Infants, and Children (WIC) program families, to using visual data to activate middle school readers, to addressing Melvil Dewey’s legacy, this issue is a treasure trove of information, knowledge, and wisdom. It’s also a rich source of topics for this blog. ALA President Jim Neal’s session at Midwinter in Denver featured a debate with two speakers in favor of neutrality (James LaRue and Em Claire Knowles) and two speakers against neutrality (Chris Bourg and R. David Lankes). A panel of four speakers responded to the debate: Emily Drabinski, Emily Knox, Kathleen de la Peña McCook, and Kelvin Watson. The full program video is available online to Midwinter attendees at bit.ly/mw18-pres. These are some of my takeaways beginning with the pro-neutrality debaters. James LaRue offered three dimensions for neutrality: service, access, and collections. In his view, neutrality is “enshrined in (library) values” and can be summarized as “everyone gets a seat at the table” (34). Em Claire Knowles noted that libraries/librarians have social goals but believes “an active, engaged, continually reaffirmed neutrality is just the first rung on the ladder to advocacy and social justice” (35). On the other side of the debate, Chris Bourg noted that “neutrality, by definition, is not taking sides” (34). Operating from that definition, he notes “decisions like how much funding a library gets, who should have access to a library, and even where a library is located are not neutral decisions” (34). R. David Lankes further unpacks the “myth of neutrality” (35) and gives this example: “a poor child needs a different level of service to meet our mission than college-educated adults in terms of literacy” (36). Emily Knox’s comment reproduced in the image above rings true for me (37). Libraries, and school libraries in particular, cannot collect every book published for youth. In our decision-making, our goal is to provide access to all sides of issues. But with limited budgets and the charge to provide resources aligned with school curricula, school librarians must pick and choose. We do so in the displays we create, the literacy programs we offer, and the ways we collaborate with classroom teachers and specialists and involve students and families in the library program. As the article in this issue by school librarian Kelsey Cohen demonstrates (see next week’s blog post), the library cannot be neutral and simply serve the students who are eager to read. 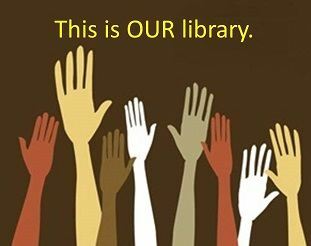 To be honest, the decisions we make reflect our shared librarianship values, the values of our communities, and our own personal values as well. In the types of outreach and the target audiences for our outreach activities, whether in school, public, or academic libraries, librarians who adhere to our value of “access” seek to be fair rather than equal. A neutral library would simply exist and serve the patrons who come. The library/librarian that assesses the community and determines how to best help people achieve their goals will, of necessity, do more for some than for others. As Kelvin Watson noted: “We can’t be neutral on social and political issues that impact our customers because, to be frank, those social and political issues impact us as well” (38). In schools, our English language learners and their classroom teachers may need more literacy support than our gifted and talented students and their classroom teachers. Youth living in poverty may need access to literacy and technology resources more than our affluent students who have access in their homes. Inviting an author from an underrepresented group to provide a literacy event may speak in more personally meaningful and impactful ways to some of our students and families than to others. In my opinion, the ways school librarians address academic, social. and political inequities is not a neutral stance. Since I was unable to attend Midwinter, I especially appreciate the excerpts available in American Libraries magazine and the links to some of the presenters’ full remarks. As noted above, I believe this article can spark a lively and critical conversation in libraries across the country and around the world. I hope you will make time to seek out, read, and discuss the issue of neutrality in librarianship in your professional learning networks. American Libraries 49 (6). June, 2018. A photograph on the Arizona Daily Star opinion page on May 3, 2018, struck a chord with me. If you have been following the national news, you know that Arizona’s teacher walkout and #RedForEd movement has been called a “Norma Rae moment.” Long underpaid and undervalued educators working with large class sizes and antiquated technology in crumbling buildings, Arizona educators and advocates have held Governor Ducey and his majority-Republican legislature’s feet to the fire. Activists are vowing to keep the momentum for improving education for Arizona’s students going through the November election. To my way of thinking, NO ONE who is passionate about youth, learning, and teaching should ever keep quiet about what kind of education today’s young people need to succeed—especially not school librarians. 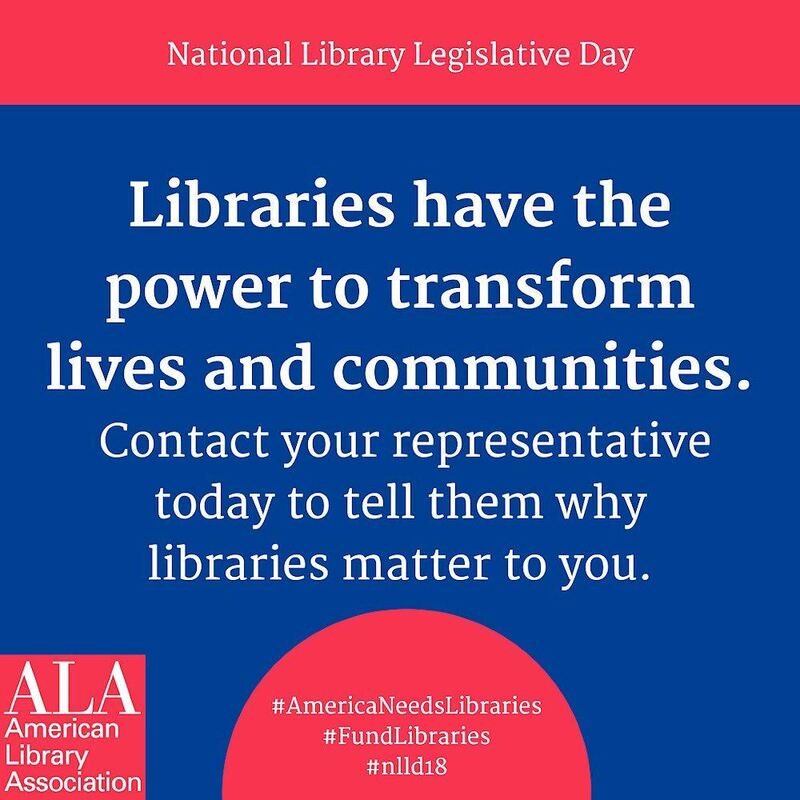 In that context, I am delighted that hundreds of librarians, library trustees, library patrons, and advocates are in Washington, D.C. for the American Library Association’s annual National Library Legislative Day (#NLLD18). I have never had the opportunity to meet face to face with lawmakers during #NLLD, but I am signed up to participate virtually today, May 7th and tomorrow, May 8th. I will be emailing, phoning, and Tweeting Arizona Senators John McCain and Jeff Flake and Representative Martha McSally during this two-day event to remind them that Arizona’s students, educators, and families need the expertise of school librarians and the services of school libraries. U.S. school and public libraries have a vital role to play in the health and prosperity of our country. Literacy learning and programming are critical services. From cradle to grave, libraries help patrons and communities meet their life goals. Access to technology tools is one essential service libraries provide. Since one in four households in the U.S. are without Internet connection, school and public libraries help level the playing field by providing students, families, and adults equitable access to the tools of our times and the digital resources that impact daily lives. ALA members and supporters advocate for their patrons all year long. The ALA Advocacy page provides a rich resource of support. This year, the American Association of School Librarians (AASL) Advocacy Committee launched AASL Connection (#AASLcxn), a quarterly advocacy and information sharing effort that includes webinars, Twitter chats, and more. The Association for Library Service to Children Everyday Advocacy page provides resources as well. In addition to these, I highly recommend the work of EveryLibrary.org. Every Library helps school and public libraries organize and sustain advocacy efforts. Signing petitions or tweeting out information for these efforts is a way for librarians to support advocacy initiative across the country. Every Library has also started a peer-reviewed journal called The Political Librarian. As an Every Library monthly subscriber, I am proud to support the activism of my colleagues. I have made a long-time commitment to write as often as possible for Tucson’s Arizona Daily Star newspaper. I believe it is important to speak up locally as well as nationally about school librarianship, particularly in a state like Arizona where so few preK-12 students and educators are receiving the support of state-endorsed school librarians. Although my letters do not always get published, my passion for our profession and what access to literacy learning means for students keeps me submitting. These are a few of my published letters to the editor and an opinion piece published within the last year. “Missing School Librarians Means Lost Literacy Learning.” Arizona Daily Star (Nov. 3, 2017). “I Know Who Goldwater Can Sue.” Arizona Daily Star Online (May 2, 2018). If school librarianship is to survive, each of us must find our way to speak up and out for our profession. Yes, it is ideal and rewarding when our administrators, classroom teacher colleagues, families, and students raise their voices in support of our work. Yet, there are many who do not have first-hand experience of what school librarians contribute to students’ learning and to other educators’ teaching. It is only by educating the larger community and speaking up for our work that we can expect to change the outdated stereotypes and under valuing of our school librarians and libraries that persist today. Please join our librarian colleagues, library advocates, and me today and tomorrow for National Library Legislative Day. Think nationally for #NLLD18 and act locally every day. Together—we can make a difference. From my reading of the news, activism among young people is on the rise. The tragedy of school shootings has activated young people, educators, families, and citizens in powerful ways. School librarians and other educators can apply what we have learned from our own advocacy efforts and activist experiences to help youth exercise empowered citizenship. 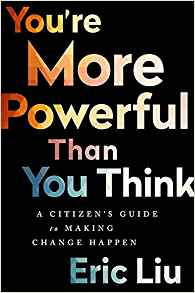 Last fall, I read You’re More Powerful than You Think: A Citizen’s Guide to Making Change Happen by Eric Liu. The author is the founder and CEO of Citizens University, an organization based in Seattle, Washington that promotes effective citizenship. Liu says he wrote this book for underdogs and challengers. “It’s for people who want to be change agents, not defenders of the status-quo” (Liu 2017, 11). It takes courage to act on what you believe in, especially when there are powerful institutions and traditional structures in place that your beliefs will disrupt. The ideas in this book are important for anyone—younger or older—who is working to make positive change happen in society. These are a few of my takeaways from this book and some ways that school librarians across the country are advocating for school libraries staffed by professional librarians and effective school library programs that can serve the needs of empowered students, educators, and families. “Movements that truly change a society will cohere only when intuitive and uncoordinated activity becomes intentional and well-coordinated” (Liu 2017, 113). The call to intentional, well-coordinated action is a foundation of any successful change process. This can be said of effective instructional planning and professional learning as well as of social movements and advocacy efforts. In his book, Eric Liu notes three opportunities for people to demonstrate they are more powerful than they (or others) think they are. Reading more about these three strategies is well worth the time. 1. Power creates monopolies, and is winner-take-all. You must change the game. 2. Power creates a story of why it’s legitimate. You much change the story. 3. Power is assumed to be finite and zero-sum. You must change the equation (71). One way the Lilead Fellows have been thinking about their school library services action plans and advocacy activities is by crafting 27-9-3 messages (27 words, spoken in 9 seconds, with three points – see 01/01/18 blog post). John Chrastka from EveryLibrary.org and collaboration among the Fellows have been instrumental in honing messages to make them more effective for their intended audience(s). These messages are about changing the “game” and the “story.” They are about building relationships in order to share power for the benefit of students. “To be sure, the citizen’s view of power is not selfless. It is often quite selfish. But whereas self-help and self-advancement focus on the individual, often in isolation, citizen power is about identity and action in the collective: how we make change happen together” (Liu 2017, 11). 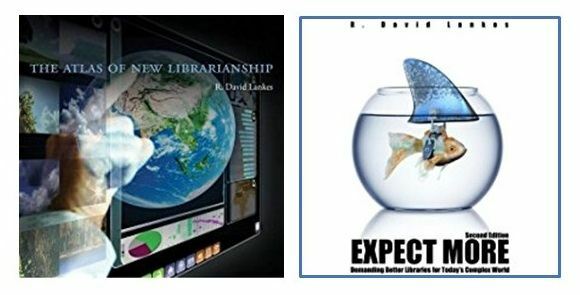 These are two examples of how school librarians are working to maintain and improve effective school library services. In response to a teacher shortage, the state’s educational standards board made a rapid unilateral decision to eliminate all coursework requirements to becoming a teacher librarian (along with 25 other content areas) in Washington state. Teacher librarian advocates rose to the cause and aggressively contacted standards board members. The board was flooded with emails, phone calls, and on-site testimonials resulting in an overturn of this reduced standards’ decision by the board. This advocacy work happened swiftly, professionally, and timely and resulted in retaining the coursework requirements for all of the 26 content-area certification standards. On February 8, 2018, the Michigan Department of Education (MDE) published a memo that was sent out to all school districts. In essence, it said that if the person in the school library is doing x, y, z (a list of things from the Michigan certification preparation standards based on certification laws), districts need to have a certified school librarian in place or the district may be financially penalized by losing a small portion of their per pupil funding. MDE’s intention was to work with districts to grow staff (by earning certification) and provide temporary permits. However, because only 8% of Michigan schools have full-time certified librarians (and 18% have part-time certified librarians), there was a huge push back from superintendents (and legislators) especially from rural districts in Michigan’s upper peninsula. As a result, MDE re-wrote the guidance without the Michigan Association of Media Educators’ (MAME) knowledge. Unfortunately, it basically says “anything goes” in school libraries including having paraprofessionals run the library. This “clarification” went out on February 15th. MAME feels the sting of this setback in an advocacy effort they have been working on since 2013. Still, they are not giving up. They are reorganizing their efforts and rethinking their next moves. As Kathy notes, advocates must keep the five Ps in mind: – present, polite, prepared, positive and persistent. School librarians can be leaders in modeling effective citizenship and collective action. We can be transparent in our activities and show students, our classroom teacher colleagues, and administrators that it takes organization and persistence. We must also show that the road to change will have its ups and downs but setbacks cannot stop us if we collaborate with a cadre of committed activists and remain true to our moral compass. Our numbers and our ideals can be sources of power as we seek to ensure empowered learning and teaching through school libraries. Liu, Eric. 2017. You’re More Powerful than You Think: A Citizen’s Guide to Making Change. New York: Public Affairs. The American Library Association (ALA) and its divisions, including the American Association of School Librarians (AASL), sent out the 2018 ballots today, March 12th. Members will have until April 4th to complete their ballots and the election results will be announced on April 11th. Of all ALA divisions, AASL has traditionally had the lowest participation in these annual elections. Typically only 11% of our members vote. We can do much better. 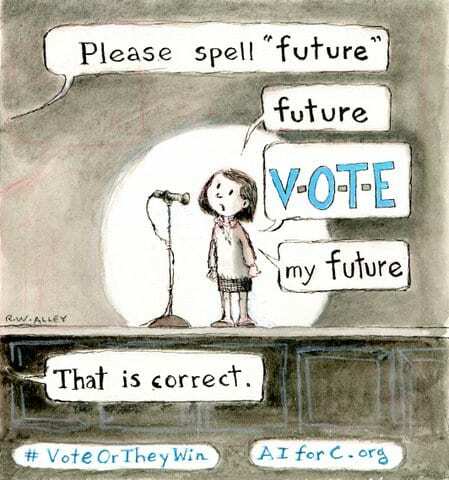 This blog post is designed to help AASL members prepare their ballots and vote for candidates who represent their values, perspectives, and interests. There is an election archives page on the Knowledge Quest website. 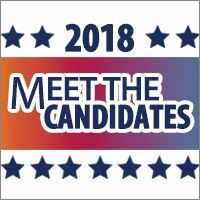 These are the candidates and links to their statements and videos. Please make time to read each candidate’s statement and view her (!) one-minute video. Fourteen (!) AASL members are candidates for ALA Council. Considering ALA President Jim Neal’s advocacy for school libraries AASL members are wise to ensure school librarian representation on the Council at this point in time as ALA moves forward to advocate for school librarians and libraries. Thank you to Helen Adams who created the list below. Please remember these names when you are completing your ballot. Thank you to all of the candidates for your activism and willingness to serve.